Home » Latest news » Entire 30 Vehicle Fleet Upgrade to Euro 6 Technology! We really have had a busy few months. Our entire (yes entire!) fleet, consisting of a mixture of 30 Mercedes Benz and Volvo vehicles has recently been upgraded for a more sustainable future. One of our main partners GTS SpA (an Italian haulage company) were the first to take the ‘green step’ within the haulage industry. Here at BSB Transport we have always been keen to reduce our carbon footprint – starting with our multi-drop service was the first step we took, some years ago now. We started to notice that out of around 5000 lorries that were visiting the Port of Immingham daily, nearly half of these would go back to their depots empty. Yes, this was daily! Imagine the impact this was having on the environment weekly, monthly, even yearly. It was time we changed our processes. The aim behind this move was to send our lorries out loaded, and come back loaded. Yes, it is an additional logistical nightmare (which our team are highly equipped to deal with! ), but it makes our whole process a lot more efficient. We work with a range of UK and international partners to increase sustainability to ensure are loads are kept as full as possible. 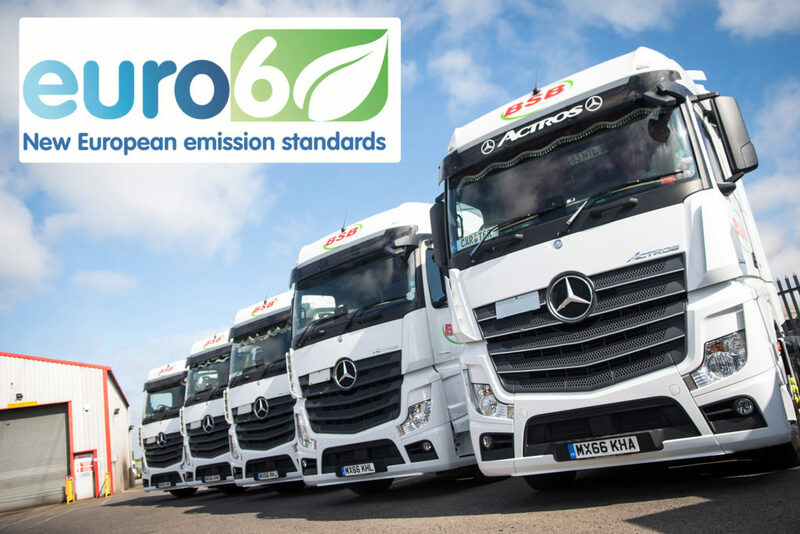 In addition to this multi-drop service, this change to Euro 6 technology allows our fleet to continue giving optimal output, without compromising fuel economy, whilst giving out the lowest possible emissions. So not only are we increasing efficiency and reducing our impact on the environment, we can also save you money! So this may all sound very technical, but basically all diesel vehicles emit Nitrogen Oxide. This is a harmful pollutant which not only damages the environment, it can also have serious health implications. By upgrading the catalytic convertors on our entire fleet, our vehicles are now emitting much lower levels of Nitrogen Oxide (we have the certificates to prove it).